RAMALLAH (Ma’an) — Figures released by the Palestinian Central Bureau of Statistics on Monday suggest that Palestinians will outnumber Israeli Jews in historic Palestine within the next two years. The results of the Palestinian census, released on the occasion of the end of 2014, show a number of other surprising figures that highlight the wide-ranging changes in demography the Holy Land is experiencing. The census estimated that at the end of 2014 the total number of Palestinians in “historical Palestine” — meaning the West Bank, the Gaza Strip, and the territory where the State of Israel is located but which often referred to as ’48 Palestine — is around 6.08 million, compared to 6.10 million Jews as of the beginning of 2014. By the end of 2016, the census bureau estimates that at current rates the number of Palestinians will eclipse that of Jews, meeting at around 6.42 million. By 2020, however, the statistics show that the number of Palestinians will hit 7.14 million, while the Jewish population will have only reached around 6.87 million. The demographic shift was expected to happen years ago, but the migration of more than a million people to Israel from the former Soviet Union in the 1990s — a large percentage of whom were not Jews, but were naturalized anyways due to the fact that they had Jewish relatives — delayed the change. The census bureau surveyed not only historic Palestine, but also included Palestinians around the world in its results. The statistics show the continuing impact of the Nakba — or the expulsion of 750,000 Palestinians from what is now Israel into refugee camps elsewhere — on the distribution of the Palestinian population, as well as the recurrent displacements and widespread flight since then as the result of the 1967 occupation and the effects of the occupation. Of the 4.6 million living in the State of Palestine, the bureau estimated that around 2.83 million reside in the West Bank and 1.79 million in Gaza Strip. “Palestinian refugees make up 43.1 percent of the Palestinian population in Palestine: 38.8 percent of them in the West Bank and 61.2 percent in Gaza Strip,” the reported added, underscoring that even within the State of Palestine itself, refugees and their descendants from the 1948 expulsions make up a sizable number. The report also compared birth rates among the Palestinian populations spread around the world, highlighting the drastic declines in fertility rates that characterized trends in the State of Palestine. “The average household size in Palestine was 5.2 persons in 2013 compared to 6.4 in 1997: 4.9 persons in the West Bank and 5.8 persons in Gaza Strip,” the report said. “The total fertility rate declined during 2011-2013 to 4.1 births compared with 6.0 births in 1997. 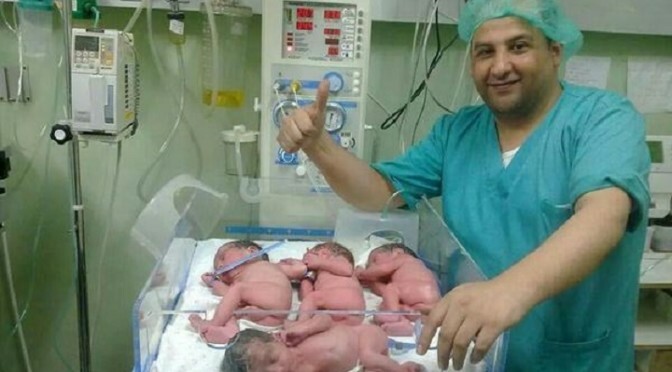 In Gaza Strip the rate was 4.5 births compared to 3.7 births in the West Bank during 2011-2013,” it added. The rates are significantly higher than Palestinian refugees living abroad, where rates are comparatively lower. “The total fertility rate for Palestinian woman living in Jordan was 3.3 births in 2010 compared to 2.5 in Syria in 2010 and 2.8 in Lebanon in 2011,” the report said. Palestinian citizens of Israel also had birthrates comparatively lower than the West Bank and the Gaza Strip, with averages around 3.4 births per woman. However, the number was higher than Israeli Jews, who have an average of around 3.1 births. “The number of Palestinians living in Israel is 1.46 million, of whom about 35.4% are aged below 15 years compared to 4.3% aged 65 years and over,” the report noted.